Do you need an engaging analogies or number talk activity for your math students? 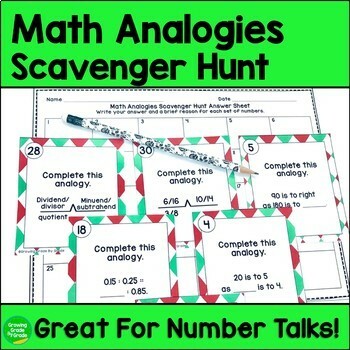 Students will have fun thinking critically and reviewing math as they hunt down the next problem in this helpful Math Analogies Scavenger Hunt! The 30 problems in this product are perfect for grades upper elementary number talks. They address Common Core standards and mathematical practices. Standards are not written on the cards, so they'll work for any curriculum! Prep is easy: Print, laminate, cut, go!